Usually the only Advent Calendars that appear in our house are the chocolate ones for the kids. The excitement each day as they opened yet another tiny bit of chocolate - even though it was just the same as the one from the day before. It got me thinking about how lovely it would be to have one to open myself every day so I did a bit of googling and settled on two very different options. 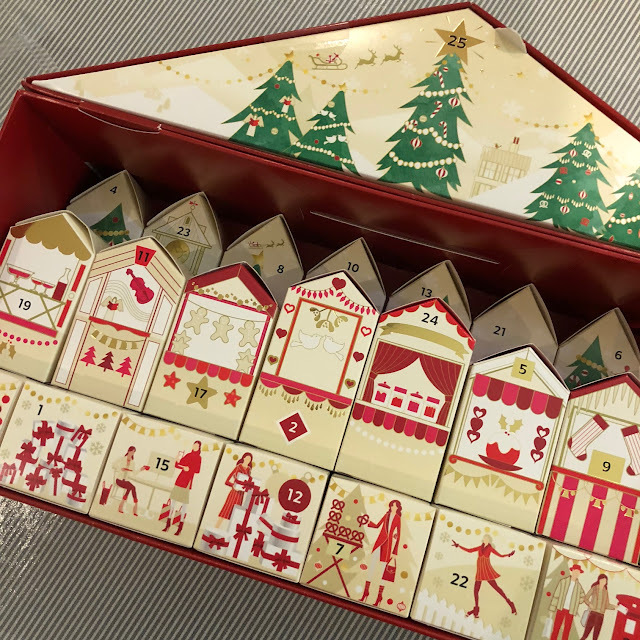 Starting with the perennial favourite... the Marks & Spencer Beauty Advent Calendar. These are sold out online now but there were loads of them in the Belfast store last week so it might be worth checking if you've a shop near you. The deal is that it costs £250 but it's only £35 if you buy items to a value of £35. So yes, there's an initial outlay of £70 but I've been told that in theory, you can return the item you bought with it for a full refund. Not sure if that's true - do enlighten me if you work with M&S. The extra big box for Christmas Day! The second one I've bought was influenced somewhat by my work. 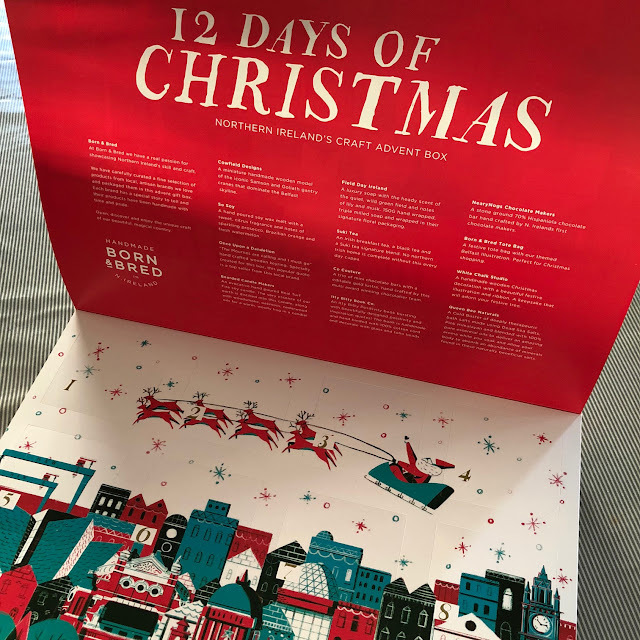 It's been created by Studio Souk, a Belfast shop (online and on Anne Street, Belfast) that showcases all that is fabulous about local artists and crafters. 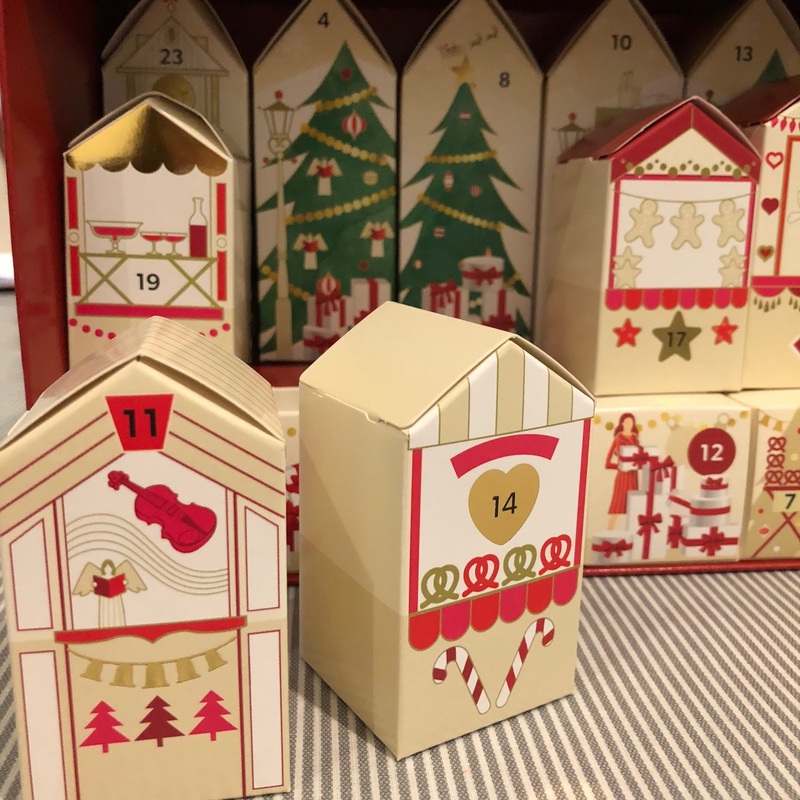 Siblings, Linzi and Dave, are the inspirational young people who run this shop and Linzi, a busy mum of 2 who has had an unbelievably challenging 2017, has worked particularly hard to get this 12-Days of Christmas Calendar off the ground. I know all this because behind one of the windows is a Field Day product and I helped Linzi with this. I was honestly blown away by how fast it turned around and as a brand, we are delighted to feature among such esteemed company. I have no idea which window is the Field Day one - I can't wait to see inside them all! Just took a sneaky peek but they're all individually wrapped inside so I'm still no wiser! 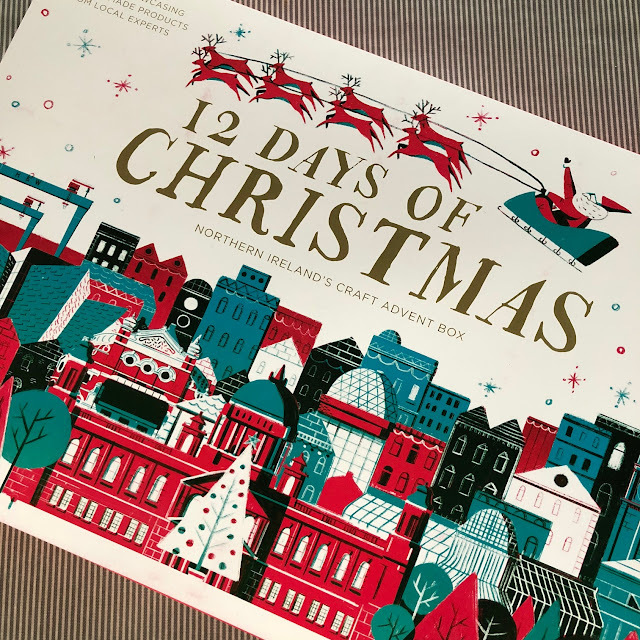 As it's a 12 days of Christmas one, it strictly speaking should be opened in the 12 days after Christmas so it is actually perfect as a gift to give on Christmas Day. 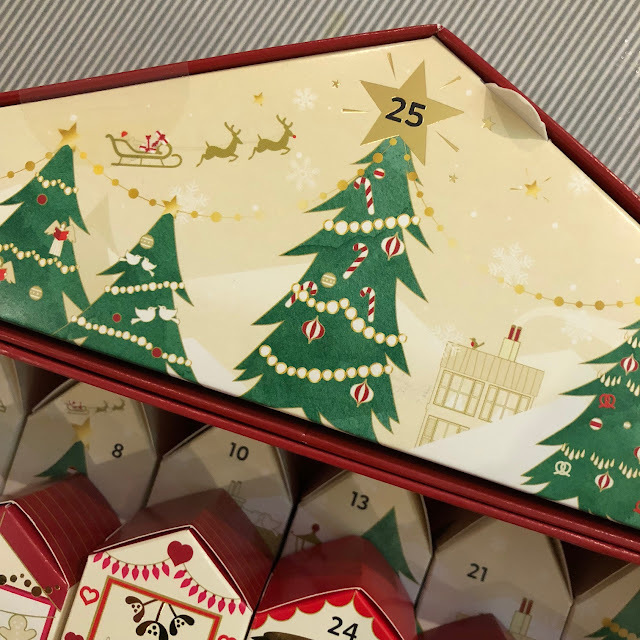 But I've checked with Linzi and she says I can open it earlier if I want : ) I think I'm going to open a window every other day on Instagram Stories - starting next week. I'm so very keen to support both Studio Souk and the local companies contained inside the calendar so I figured it's best I showcase it early so that if you want to buy one as a gift, you can before they sell out. But now for the best bit - how would you like to share the fun of this 12 Days of Christmas Calendar with me? Linzi at Studio Souk has been kind enough to give me a calendar to give away here one the blog so to be in with a chance of winning it, simply follow the instructions on the Rafflecopter attachment below. The giveaway is open worldwide and you don't have to be from Northern Ireland to enter. The winner will be drawn on Sunday 3rd December and I'll get the calendar posted out to you on Monday 4th! Disclaimer - I bought both advent calendars myself though Linzi at Studio Souk gifted me the second one to give away here. I've not been paid to write this post. I have bought the M&S advent calendar already and can't wait to start opening the boxes. The Studio Souk one looks like fun too! I've returned my qualifying purchase and kept the M&S beauty box in the past. Would love to win the studio Souk calendar. Already followed you both on instagram & now on fb as well. I am currently in the middle of filling last year’s M&S one for my children to open this year..... lindor chocolates and Ferraro rocher - along with some pens, makeup, small toiletries etc - better than their usual. Following A Life to Style and Studio Souk on Facebook! I am a long term follower of both A Life to Style and Studio Soul. Love both advent calendars. The 12 days of Christmas calendar is such a wonderful way to promote the best of N. Ireland. Really must look this shop up when I'm next in Belfast- hopefully before Christmas! Following both "A Life to Style" + "Studio Souk"
That is such a fab idea about using the M&S calendar for the kids next year. I bought myself the M&S one and still haven't got the girls their calendars yet, bad mother!! 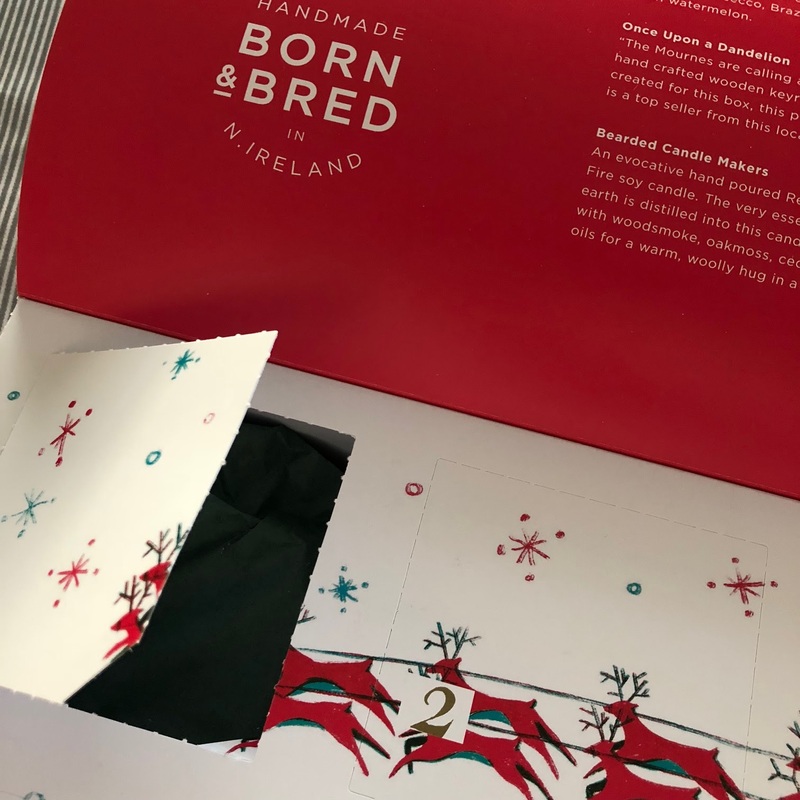 M&S treating me horribly about the advent calendar I ordered and now say they can't get me one at all and I have to hunt through shops if I want one. If you return the items you are no longer entitled to the 'discount' and M&S within their rights to charge you the full £200odd pounds that they market the calendar as costing. I'm really kicking myself for not getting on the M &s bandwagon earlier. It's out of stock in my local store. I'm noting to pay more attention next year. I follow Life to Style and am now following Studio Souk FB page. Happy days. The Studio Souk shop looks amazing! I'd love to win the calendar! Love your blog and Instagram. The studio souk advent looks amazing!! Love the idea of the studio souk calender. On maternity leave so would be a splurge but maybe I'll be lucky enough to win! Very nice! I am following both under Dee Johnson. Thanks! Can't wait to start my marks calendar. Must pay a visit to studio souk on my next Belfast trip! I love Studio Souk and also Avril’s great blog... she has been responsible for me buying many great products and clothes over the years! I’m following both 'A Life to Style' and 'Studio Souk' on Facebook! This is an amazing idea loved seeing the first one on Insta Stories today. Like both and entered! Thank u! What a lovely prize...fingers crossed. Following both on Facebook. The Studio Souk calendar sounds fantastic! I wanted to get the M&S one but left it too late. It looks really good value and I definitely need to get it next year. Last year I had a body shop calender and this year I have refilled it with bits and bobs and given it to my parents. The studio souk one is a lovely idea,I haven't come across any with local businesses before! Have followed both on Facebook. Also I should mention this comment might not match up with the email I used to enter. I entered with the name Amy H*** and amyh***@hotmail.co.uk.